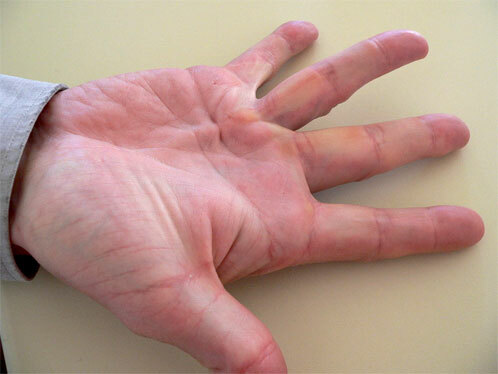 Dupuytren’s disease is an abnormal thickening of the palm that may limit movement of the fingers. In serious cases, a cord forms beneath the skin that stretches from the palm into the fingers. The cord causes fingers to bend into the palm so they cannot be fully extended. Sometimes, the disease will affect other areas of the body – such as the knuckles of the fingers or the soles of the feet. The cause of Dupuytren’s is unknown and there is no permanent cure. But, the disease is harmless and painless. Dupuytren’s disease mostly affects white people with ancestors from Northern Europe. It occurs more often in men than in women, and usually starts after age 40. In many cases, the disease runs in families. Take medications to stop seizures from occurring Injuries of the hand have not been directly linked to causing the disease. The disease most often begins in the palm of the hand at the base of the ring or little fingers. The lump or pit may show up months or even years before the cord develops from the palm to the fingers. Having the disease in both hands is common. Drawing the fingers into the hand can occur at the joints at the base of the fingers, or the joints in the fingers. The skin may be involved with the disease, but the tendons in the hand are not affected. Dupuytren’s disease usually shows up as a small lump or pit in the palm. This tends to occur near the crease of the hand that is closest to the base of the ring and little fingers. With time, the cord may develop between the palm and the fingers. The disease is usually noticed when the palm cannot be placed flat on an even surface, such as a tabletop. In severe cases, drawing of the fingers into the palm interferes with everyday activities, like washing hands, wearing gloves, and putting hands into pockets. There is no permanent cure for Dupuytren’s disease. Surgery can relieve the bending of the fingers into the palm, but the condition can return with time. The goal of surgery for Dupuytren’s disease is to restore straightening of the fingers. Your doctor should advise you on whether surgery is recommended in your case. Presence of the lump in the hand does not mean that surgery is required. Bending of the fingers into the palm at the base of the fingers is usually correctable by surgery. Surgery may not completely relieve bending of the fingers at the joints in the fingers. It is important to remember that surgery is not a permanent cure for this disease. After surgery, thickening of the palm and development of the cord may return in the same place, or at a new place within the hand.